How does your weight in and out affect the flavour of your coffee, you ask? Read on for some insights on weighing, along with a look at various models of scales. Your dry coffee weight, or dose in, is the amount of coffee you’re putting in your handle before you brew your espresso. This is measured in grams. Gone are the pseudo scientific measurements of squishing a puck or tamping to the line of your basket. Weighing and controlling your dose in grams is ensuring you have consistency in how your espresso is being brewed – both in regards to brew time (higher dose and same grind = longer brew time) and extraction levels (higher dose and coarser grind = underextraction). Measuring your dose is the first step on the path to becoming a coffee sage – we recommend starting at 21g, with no more than a gram more or less (20-22). Your dose should also correlate to the amount of water you’re passing through the puck – a higher dose with the same shot length will give you a more concentrated shot at the expense of flavour clarity, a lower dose at the same shot length will be more dilute and less intense. Weighing your yield, or dose out, is super important too. Again, back in the day this was measured in mLs with a 30ml standard. We’re now measuring this in grams, too, as a far more accurate representation of what’s happening during the brewing process. You may notice if you’re using our single origins that the yields are different to your blends – this is due to differences in origin and roast profile. Our recipes can be found here. 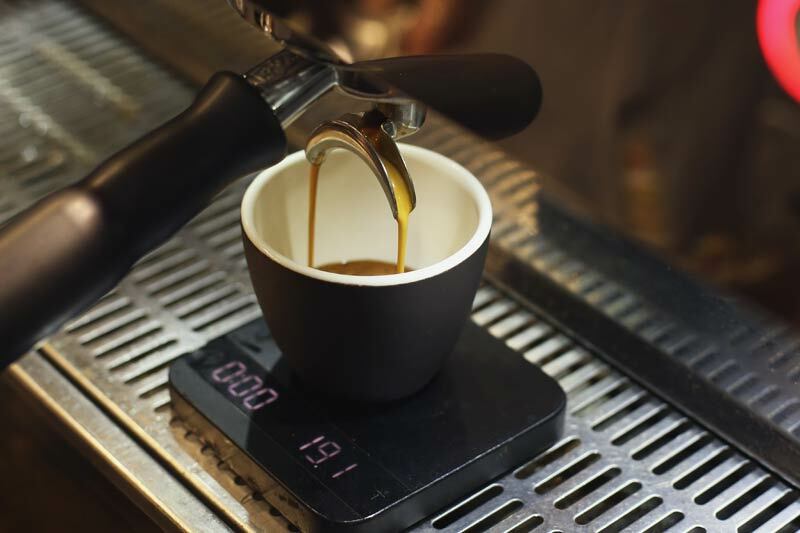 Your yield can be set using the machines volumetric buttons, allowing you to have consistency during service. If you need help getting these set up or altered, feel free to grab one of the tech guys to check your equipment. Getting tight with your set of scales will make fine tuning flavour in your coffee a dream. Dry dose changes can sometimes happen by accident as you’re changing the grind, so it’s best to always whip your scales out when you’re making any adjustments. Keeping this under wraps will improve coffee quality and help with consistency between baristas too – win win! Now onto to the different bits of weighing kit you may come across and their foibles (read: tips and tricks that will make your life easier). This can be a useful buyers guide too – if you’re looking to step up your weighing game get in touch and we’ll be more than happy to help you out. The $8 ebay special, these guys are ideal if you’re balling on a budget or looking for some disposable scales to put in front of your drip trays’ firing squad. Accuracy is key here, so make sure you find some that weigh to a decimal place. These guys will often automatically turn off if they’re not active, so make sure they’re on (duh) before you start trying to weigh stuff. Putting a bit of double sided tape around the inside of the battery case can help water proof them a little, helping to extend their shelf life. These guys have fast become a staple in almost every specialty coffee bar. They’re great value for money, have an inbuilt timer and weigh to a decimal place. Check, check and check! They’re not without their quirks though, as the response time can be a little lag-y (read: cut your shots about 3 grams short and give it a few seconds to catch up if you’re adjusting dose). The Hario scales also like to be treated right when you turn them on – have the group handle on the scales when you start them up and you’ll get a measurement to a decimal place. Well thought out, fast and sleek, the Pearl is a great scale to have in any barista’s arsenal. They comfortably fit a group handle and can squeeze onto the drip tray at a pinch too, making them pretty damn handy. Look out for anything touching their side though as their weighing mechanism works a little differently to the above scales and will go a bit haywire if bumped. Make use of that rubber mat too – it’s designed to protect the internal mechanism from heat that will affect accuracy – particularly when brewing filters. That little guy can also be flipped upside down to support your group handle nice and snuggly. These bad boys are the pinnacle of accuracy when it comes to coffee scales. They’re huge (read: not portable) and are great for high volume places weighing every dose. That said, there’s no way you’re getting them onto a drip tray, so not great for checking your yields as you go. Guess everything is a trade off, right? Regardless of what kind of scale you go for, you want to make sure you’re putting it on a nice flat bench. Some scales won’t even work on tea towels as they need a stable surface to weigh on. Keep your bench space in mind when you’re making the investment – right tool for the job etc. When you’re measuring yields on the drip tray it’s good to get in the habit of wiping the tray down before you stick the scales up, as the moisture will quickly kill them. Happy weighing!